Wonder if the courts will treat everyone that disregards an order the same way? I guess I don’t truly understand the issue. When you want to register to vote, you go to a county office and register. When someone needs a Texas driver’s license or Texas ID card, they have to appear in person for that, initially, so that’s not an issue. Is the issue that people who chose not to register at the time they initially appeared in person at the DMV are having trouble registering to vote online? If so, what is the remedy sought with the lawsuit? “The DPS website eventually directs Texans who check “yes” to the statement “I want to register to vote” to the Secretary of State’s website. 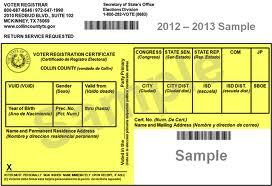 There, they can find a registration form that they must print out and send to their county registrar. What, exactly, do the plaintiffs want? Bigger font on the “does not register you to vote” language? Seems like that would be an easy fix. I truly don’t understand why this is a court battle in the first place. If language is confusing, a simple rewrite should fix the issue, yes? Otherwise, pick a font size that will be acceptable for “does not register you to vote” to be written in, in order to NOT be confusing and go with that. The issue, Bill, is that if you go to the DPS office and change your address in person, your voter registration is automatically changed. If you change the address online, you have to do a separate step to get the voter registration changed. It ought to work the same way, regardless of how you change your license address. That seems fairly reasonable. Of course, either way, we are talking about a few more or a few less mouse clicks….not really ZOMG! Voter suppression! It’s really not much different than following a link someone has posted here to read more about a subject. I wonder how much it would cost to program the DPS computer to automatically change a voter’s registered address? Probably less than the cost of defending a lawsuit. Does this mean we are OK with linking the DPS website to the Sec. of State website to download the original voter registration application, or is that too hard as well? Seriously, if the goal here is to simply get a voter’s address changed when the DL is changed, then I agree, why not do that? Filing a lawsuit over it, though, seems like making a mountain out of a molehill, and defending against such a lawsuit seems like chasing good money after bad. If you can’t figure out a website notification that clearly reads ‘Does Not Register You To Vote’ [regardless of font size], then directs you another website with a form you need to fill out and send in, you have no business voting in the first place.